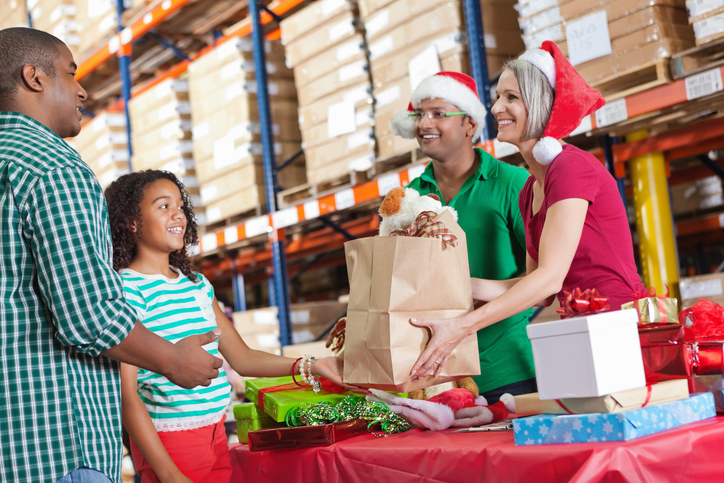 December is more than just a season of cheer–it’s a time for charity as well. Has your company come up with good ways to give back? Don’t assume you’re too small to make an impact, even if you think of yourself as a mom-and-pop shop. According to data from Ernst & Young, family businesses account for 55% of all philanthropic donations in the U.S. In fact, small companies of every type are stepping up their generosity. When Alignable, a social network, surveyed small business owners in 2015 about their charitable contributions, 47 percent said they planned to give even more than they had in 2014. Get together for a group volunteering event. Have your whole staff assist a nonprofit organization with its efforts for a few hours or an entire day, whether it’s beautifying a local park, serving a meal at a senior center, or manning a table at a fair for underprivileged children. Give each of your employees a hat or name badge with your logo, and everyone will know that your company really cares. Create a limited-edition product and announce that you’ll donate part of the proceeds to your favorite cause. (Think of a unique cupcake design if you’re a bakery, for instance, or design an airbrushed shirt if you run a boutique.) If the item becomes trendy, more people than ever may seek you out to get their hands on it while they can. Sponsor employees’ charitable endeavors. Do a few staffers want to, say, run a 5K to fund medical research? Offer to pick up the registration fee, and provide water bottles with your imprint. Spectators will see you’re behind your staffers every step of the way. Donate your excess inventory to a good cause. Got too many promotional totes? A group that collects canned goods for the needy might really appreciate those bags. That pile of company t-shirts left over from your corporate picnic could be the very thing an underfunded local sports team would enjoy. Bonus: In some instances, contributions of this kind will qualify you for a tax deduction. No matter what, you’ll free up some valuable storage space at your workplace. Offer up a goody for a charity auction. Many worthy groups, from national charities to your local PTA, hold auctions and raffles throughout the year to raise funds. Contributing a single prize–anything from a gift certificate for your services to one of your signature products–will help reel in bidders. Your name will likely be seen in the program and displayed by the item, and if you tuck a small personalized gift such as a pen or keychain into the prize package, the lucky winner will remember your generosity for a long time to come. It’s easy–even enjoyable–to give. And you might find yourself on the receiving end, too. A study by Cone Communications says that 85% of Americans have a better opinion of companies that support causes they care about. In that way, your philanthropy may not only help the needy, but give your image a helpful boost, too.